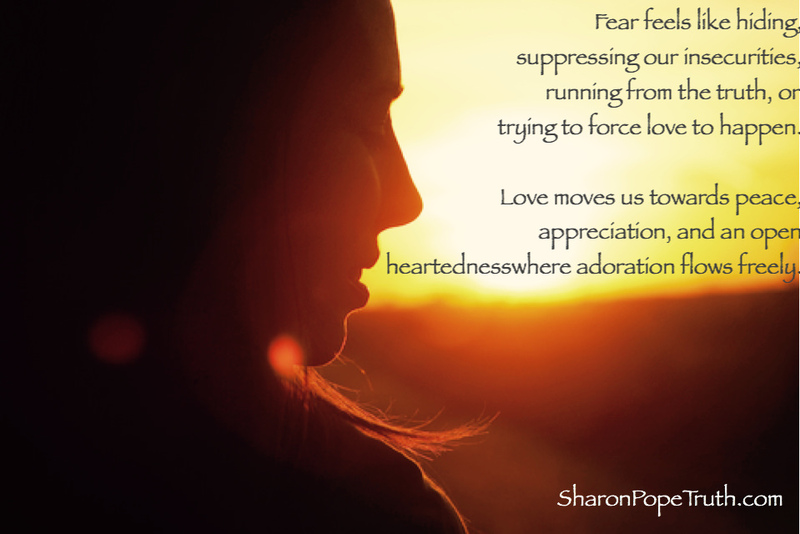 Fear moves us towards self-judgments such as What is wrong with me? On the other hand, love feels like freedom – freedom to express ourselves authentically and unapologetically. Love feels like wide open space – space to take long, deep breaths, and room to move and play and dance. Love moves us towards peace, appreciation, and an open heartedness where adoration flows freely. In any given moment, we can simply stop to ask ourselves if what we’re doing right now feels more like fear or love. The way we feel about the woman at work who we always compare ourselves to, does that comparison feel closer to fear or closer to love? The self-talk that begins almost as soon as we step out of the shower and begin our day, does that feel more like fear or love? The way we allow toxic people time on our calendars and space in our hearts, does that feel more like fear or love? The way we keep our stories, hide our hearts and play small in love so that we never get hurt, is that closer to fear or closer to love? In any given moment, for any situation, simply stop to ask yourself if it feels like walking towards fear or walking towards love.